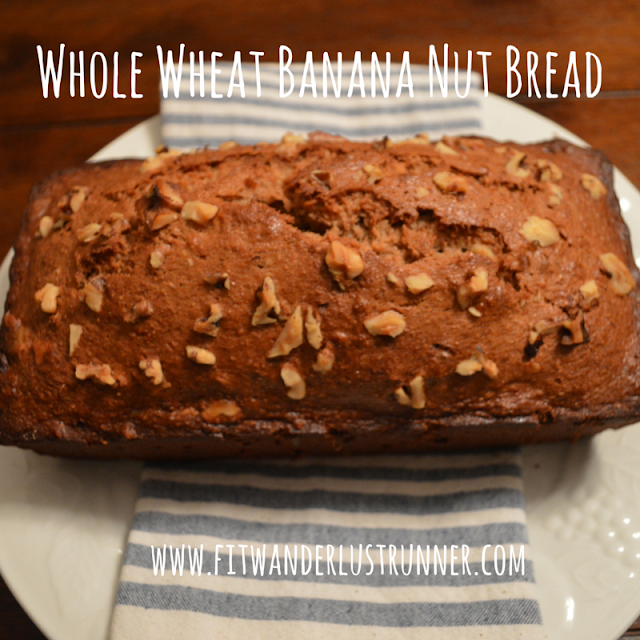 Fit Wanderlust Runner: Delicious Whole Wheat Banana Nut Bread Recipe! It has been awhile since I had baked anything from scratch. Two weekends ago I made some cupcakes for our house warming party but they were made from a box. They were great and easy to make but I really love baking something from the very beginning. Cooking and baking is kind of a little stress reliever for me. Some things turn out great while others unfortunately don't turn out the way they are supposed to. Baking really is all about chemistry. One wrong ingredient can really screw it all up. Luckily last night I seemed to get it all right. Since my bananas were ripe, my natural instinct was to bake something with them. I asked my husband if he had a preference and he chose banana nut bread. He tends to like having some type of pastry with his coffee in the morning. He used to always get the banana nut bread from Starbucks but now that we have a Keurig I try to have some type of pastry available to him. 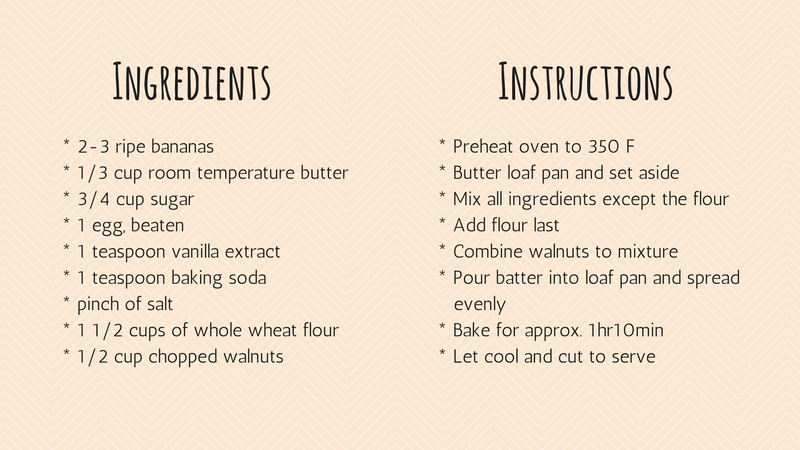 I love to make banana bread and I am constantly trying to make a recipe that is healthier but still tastes just as great. This time around I decided to make this bread with whole wheat flour instead of all purpose flour. 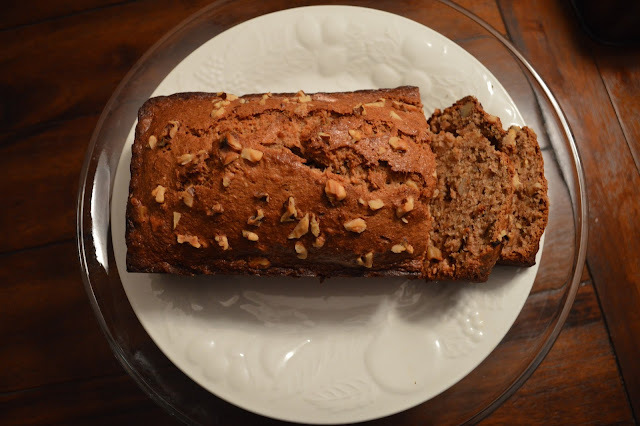 The end result was a moist delicious banana nut bread. Cooking and baking is a stress reliever for me too - and your bread looks wonderfully moist! 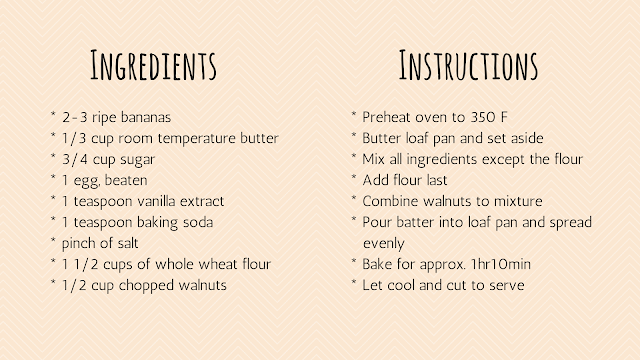 Love your use of whole wheat flour in this recipe! if i used almond flour instead so u think it would still work? Heather I have actually never used almond flour so I would hate to give you the wrond advice. I know there are great recipes out that do use almond flour but I have yet to venture that way. Let me know if you try it!